An analysis in the New York Times about the barbaric murder of Father Jacques Hamel noted that some leading Catholics immediately compared Father Hamel to Blessed Oscar Romero, who was also killed at the altar. The Rev. James Martin, SJ (@JamesMartinSJ) said in a tweet that “A martyr looks like this. Fr Jacques Hamel, killed while celebrating Mass, like Thomas of Becket and Oscar Romero.” The comparison has been repeated by Cardinal Sean O'Malley; by Chaldean Patriarch Louis Raphael I Sako; and also by Archbishop Vincenzo Paglia. In fact, Fr. Hamel has joined a small and select group of martyrs who have died in church. In addition to the Blessed Romero and St. Thomas Becket, we can list St. Stanislaus, Bishop of Krakow. But within this core group, only P. Hamel and Archbishop Romero have been killed while celebrating Mass. In his words about the murder, Pope Francis referred to Fr. Hamel as “This holy priest, who died at precisely at the moment in which he offered the prayer for the whole Church”. In this statement, John Paul captures the full meaning of martyrdom at the altar, a death that comes during the celebration of Mass. But there are, unfortunately, other similarities that link the death of Fr. Hamel with that of Archbishop Romero, and it was Chaldean Patriarch Sako who denounced one of them—the instant manipulation of the martyrdom of Fr. Hamel. “Reducing everything to appeals and initiatives to foment indignation is sacrilegious blasphemy in my view, towards the martyrdom of Fr. Jacques and that of all others,” said the Patriarch in an interview. Some have tried to use the death of Fr. Hamel to heighten the conflict and seek revenge against the Muslim world. A note published in Il Tempo has been translated and published by conservative outlets, lashes out against “false mercy” and warns of the need for armed resistance against Islam. The editorial has harsh words for the Holy Father, “Pope Bergoglio’s silence is parallel to that of Muslims from all over the globe who don’t denounce forcefully and in an unanimous, collective manner, the crimes committed in Allah’s name by their co-religionists”. The intent to juxtapose the martyr against a pope to promote the theological differences they have with the Pope recalls the misrepresentations made to attempt to place Blessed Romero in conflict with John Paul II by folks seeking to make the Polish pontiff look bad. In that sense, the figure and the martyrdom of Romero was manipulated by insinuations that John Paul had abandoned him, did not like him, that he was close to his executioners, etc. It is the same as what people from the other side of the aisle are doing with this “holy priest”. In the final analysis, Fr. Hamel and Archbishop Romero are joined in martyrdom, and the case of Fr. Hamel helps us understand the meaning of martyrdom in the modern world. Many refused to acknowledge it in the Romero case because his killers were Catholics. One can imagine that a cynic could argue that Fr. Hamel is not a martyr, perhaps taking advantage of the Pope's statement that his death was not the result of “a war of religions” (to wrongly conclude it was not “in hatred of the faith”). It can be argued that the Islamic State attacked an atheistic satirical magazine in France on one occasion, a gay bar in Florida the next time, and have created many more Muslim victims than Christian ones. However, the symbolism of a death at the altar speaks very eloquently to discredit such arguments. As Father James Martin puts it: “A martyr looks like this”. Un análisis del New York Times sobre el asesinato barbárico del P. Jacques Hamel señaló que inmediatamente después del crimen algunos católicos importantes han comparado al P. Hamel con el Beato Óscar A. Romero, quien también fue asesinado en el altar. El Rev. James Martin, SJ (‏@JamesMartinSJ) declaró en un tuit que “Así se ve un mártir. P. Jacques Hamel, asesinado celebrando la misa, como Tomás Becket y Óscar Romero”. La comparación ha sido repetida por el Cardenal Sean O’Malley; por el Patriarca de Babilonia de los Caldeos ‎Luis Rafael I Sako; y también por el Arzobispo Vincenzo Paglia. En verdad, el P. Hamel se ha integrado a un grupo reducido y selectivo de mártires que han muerto en la Iglesia. Además del Beato Romero y Santo Tomás Becket, podemos nombrar a San Estanislao, Obispo de Cracovia. Pero dentro de este núcleo, solo el P. Hamel y Mons. Romero han sido caídos durante la celebración de la misa. En sus palabras sobre el asesinato, el Papa Francisco se ha referido al P. Hamel como “Este santo sacerdote, que ha muerto precisamente en el momento en el que ofrecía la oración por toda la Iglesia”. En esa elocución, Juan Pablo recoge todo el significado de lo que es un martirio en el altar, una muerte durante la celebración de la Misa. Pero hay, por desgracia, otras similitudes que vinculan la muerte del P. Hamel con la de Mons. Romero, y fue el Patriarca de Babilonia quien denunciara una de ellas—la instantánea instrumentalización del martirio del P. Hamel. “Reducirlo todo a llamados e iniciativas para fomentar indignación es una blasfemia sacrílega en mi opinión, hacia el martirio del P. Jacques y la de todos los demás”, dijo el Patriarca en una entrevista. Algunos han tratado de usar la muerte del P. Hamel para agudizar el conflicto y buscar la venganza contra el mundo musulmán. Una nota publicada en Il Tempo que ha sido traducida y publicada por medios conservadores, arremete en contra de una “falsa misericordia” y advierte sobre la necesidad de una resistencia armada en contra del islam. El comentario hace duras críticas al Santo Padre: “el silencio del Papa Bergoglio es paralelo al de los musulmanes de todo el mundo que no denuncian enérgicamente y de forma unánime y colectiva, los crímenes cometidos en nombre de Allah por sus correligionarios”. La intención de yuxtaponer al mártir contra un papa para beneficiar las diferencias teológicas que mantienen con el papa hace recordar la tergiversación que se trató de hacer para tratar de meter en conflicto al Beato Romero con San Juan Pablo II por gente que buscaba hacer ver mal al pontífice polaco. En ese sentido, se instrumentalizó la figura y el martirio de Romero al insinuar de que Juan Pablo lo había abandonado, no lo quería, era cercano a sus verdugos, etc. Es lo mismo que ahora gente del bando opuesto está haciendo con este “sacerdote santo”. En el análisis final, al P. Hamel y Mons. Romero los une el martirio, y el caso del P. Hamel nos ayuda a comprender mucho el significado del martirio en la modernidad. Muchos se negaron a verlo en el caso Romero porque fueron católicos los que lo asesinaron. Es posible imaginarse que una persona cínica sostenga que el P. Hamel no es mártir, quizá aprovechando de la declaración del papa de que su muerte no fue producto de “una guerra de religiones” (para concluir erróneamente que no fue “en odio a la fe”). Se puede argumentar que el Estado Islámico ataca una revista satírica atea en Francia en una ocasión, un bar gay de Florida la próxima vez, y muchas más víctimas musulmanas que cristianas. Sin embargo, el simbolismo de una muerte en el altar nos habla con mucha elocuencia para desprestigiar tales argumentos. Como dice el P. James Martin: “Así se ve un mártir”. In social media advisories such as the above, Salvadoran youth attending #WorldYouthDay in Krakow were asked to bring a piece of Salvadoran Catholicism with them. Now that El Salvador has its first blessed, this placard reads, "Blessed Romero at the WYD! 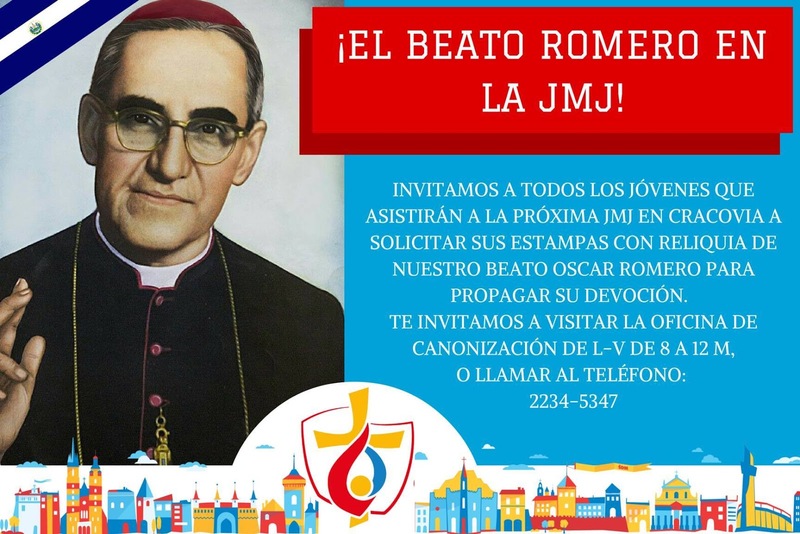 We invite all the young people who will attend the upcoming WYD in Krakow to request their holy cards with the relic of our Blessed Romero to spread his devotion." 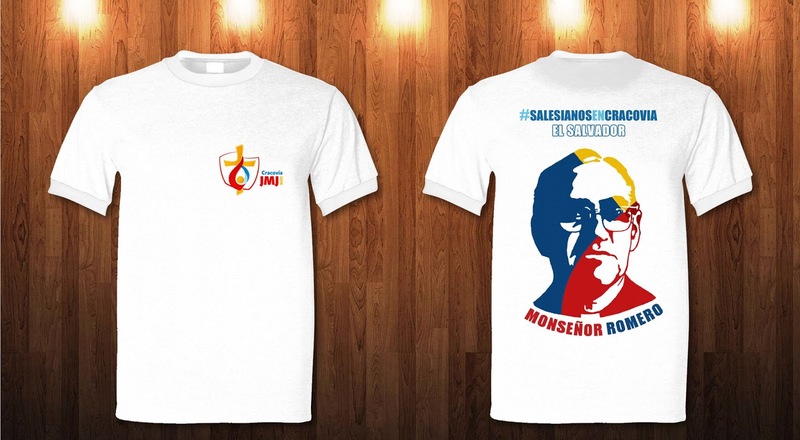 Los salesianos que forman parte de la delegación salvadoreña en Cracovia para la Jornada Mundial de la Juventud han llevado a Polonia una imagen del aporte salvadoreño al catolicismo mundial—algunas de sus camisetas lucen la imagen del Beato Oscar Romero, el primer santo salvadoreño. Alla Messa di partenza per la delegazione salvadoregna alla Giornata Mondiale della Gioventù a Cracovia, un giovane uomo rappresenta il Beato Oscar Romero. Ora che El Salvador ha il suo primo beato, i partecipanti salvadoregni al evento cattolico mondiale desiderano condividerlo con il resto del mondo. Romero at the Polyclinic; Don Gaspar with Fr. Sobrino. At the door of the polyclinic my daughter-in-law and I ran into each other. She says, "Miss Zaida, Miss Zaida" and everyone who was with her embraced me. "Stay calm, stay calm, remember what I told you." They did not want to let me in the room where they had him. "I’m going in," I said, “because I have been by his side for 26 years." [After I went in, l] I kissed his forehead and then I don’t know why I clenched his feet. His feet were already cold, cold. What an awful thing. Gaspar Romero and his brother Mamerto, also dead now, stayed by the body for what was to follow. 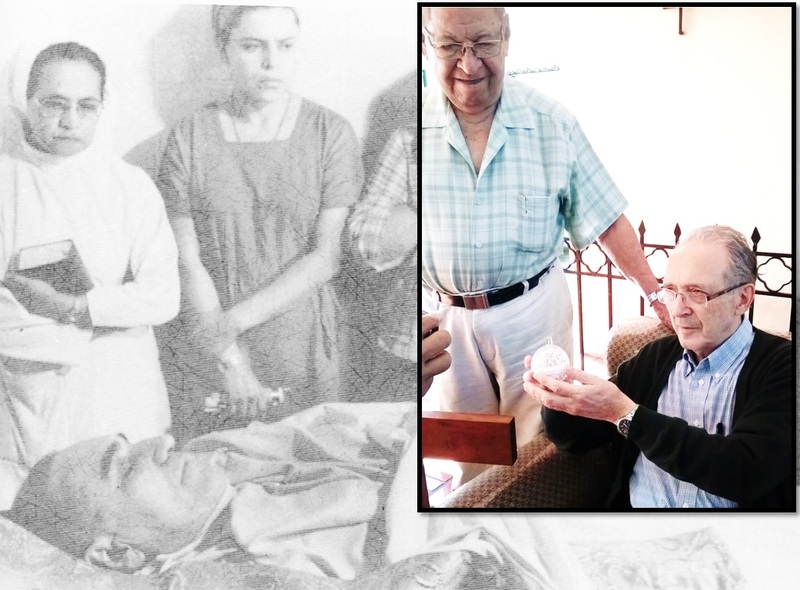 “I saw when they opened the left side of his chest to extract the broken up fragments of the bullet,” recalls Gaspar Romero. Mamerto’s widow remembers how the late brother vividly recalled the shrapnel embedded in the flesh and tissue of the thorax. “He would say all the time, it was like grains of sand and he could never forget it,” says Tinita, widow of Mamerto. After the procedure, the scene became a kind of scavenger hunt in which everyone tried to take some memento—or relic—of that terrible but historical moment: a vial with Romero's blood that doctors had collected; bloodstained sheets which the nuns later fashioned into scapulars to hand out to devotees; pieces of the bullet; a handkerchief used to wipe the blood from Romero’s body ... even his pectoral cross. When a reporter was leaving with the piece of rib extracted from the chest of the martyr, Gaspar Romero stopped him and forced him to give him the valuable relic. He has kept it these thirty-five years. In that time, “the bone had deteriorated into a mass of crumbled powder,” says the conservator Graffius. “On my advice, Don Gaspar allowed the bone to dry out, and I separated it into two small crystal reliquaries,” says Graffius. “One was retained by Don Gaspar’s family, the other he generously donated to the Sisters at the Hospital of Divine Providence,” the place where Romero had lived the last three years, and where he gave his life on that fateful March 24, 1980. Fr. 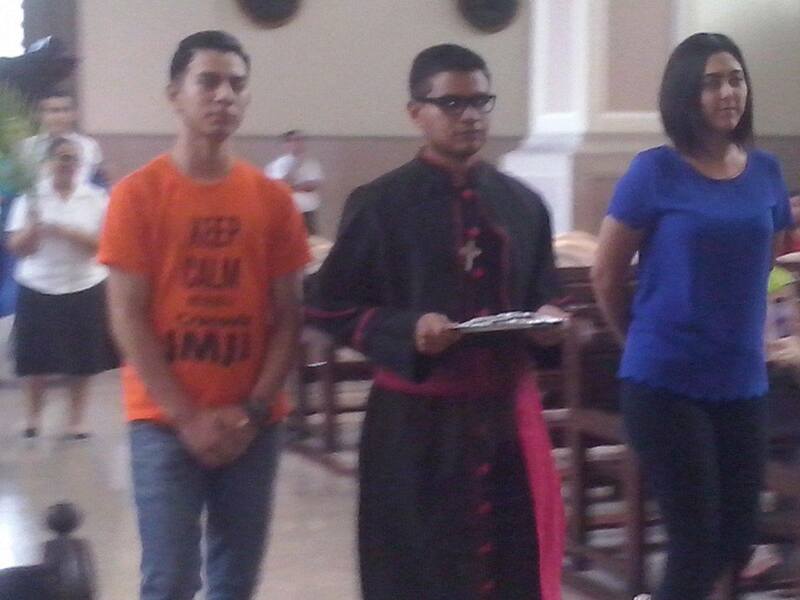 Jon Sobrino celebrated Mass that formalized the handover. Romero en la Policlínica; Don Gaspar con el P. Sobrino. Una de las reliquias más extraordinarias del Beato Óscar A. Romero ha sido instalada en la casita donde Romero vivió en el campus del Hospitalito de la Divina Providencia. La conservadora británica Janet Graffius cuenta sobre el proceso de las reliquias en la edición más reciente de Romero News, publicada por la Romero Trust en Londres. La reliquia, cuenta Graffius, constituye “un recordatorio siniestro del sacrificio de Romero; un pedazo de su costilla, sacada en el post-mortem y confiada al hermano menor de Monseñor, Don Gaspar Romero”. Para contextualizar la reliquia, es necesario volver hacia atrás en el tiempo y vislumbrar el escenario de aquel momento. Romero fue ingresado a la Policlínica Salvadoreña inicialmente para tratar de salvar su vida, pero finalmente se practicó allí su autopsia después de esfuerzos inútiles por salvarlo. De manera que la noticia del asesinato circuló por la capital, la gente empezó a llegar al hospital, incluyendo los hermanos de Romero. Tiberio, Mamerto, Zaida y Gaspar. “Al llegar ni me querían dejar entrar, pero me identifiqué”, recuerda Gaspar Romero en una entrevista. “Como a las 10 entraron todos mis parientes, y ahí estuve toda la noche”. En la puerta de la policlínica nos encontramos con mi nuera. Me dice: "Niña Zaida, niña Zaida", y ya me abrazaron los que andaban con ella. "Calmadita, calmadita, acuérdese lo que le decía". No me querían dejar entrar allá en la habitación donde lo tenían. "Yo me entro", le dije, "porque anduve con él durante 26 años". [Al ingresar, l]e besé la frente y después yo no se por qué le apreté los piesitos. Los piesitos ya helados, helados. Mire que tremendo. Gaspar Romero y su hermano Mamerto, también ahora difunto, permanecieron junto al cuerpo para lo que venía. “Vi cuando le abrieron la parte izquierda del tórax para extraerle los fragmentos de una bala explosiva”, recuerda Don Gaspar. La viuda de Mamerto recuerda como el extinto hermano recordaba vivamente la metralla (pequeños fragmentos de la bala) que quedo incrustado en la carne y el tejido del tórax. “Así decía él a cada rato, que era una arenilla y que eso no lo podía olvidar”, dice Doña Tinita, viuda de Mamerto. Roberto Cuellar, miembro del Socorro Jurídico del Arzobispado, también se quedó a la par del mártir durante la necropsia. “Lo impresionante de la autopsia”, recuerda Cuellar, “fue ver cómo le partían el esternón, porque aquellos eran métodos rudimentarios, sin las motosierras ni el instrumental eléctrico que se utilizan ahora. Con Romero tuvieron que usar una especie de cincel. ¡Pa, pa, pa!, para romper el hueso”, dice Cuellar martillando en el aire. Según el informe de la autopsia, “La bala penetró a la altura del corazón y siguió una trayectoria transversal, alojándose finalmente en la quinta costilla dorsal”. Después del examen, aquella escena se volvió una especie de cacería, en que todos trataban de llevarse algún recuerdo—o reliquia—de ese terrible pero histórico momento: un frasco con la sangre de Romero que los médicos habían colectado; sábanas ensangrentadas de cuales las monjas después hicieron escapularios para repartir a los devotos; los pedazos de la bala; un pañuelo usado para limpiar la sangre del cuerpo de Romero … hasta su cruz pectoral. Cuando un periodista se iba con el pedazo de costilla extraída del tórax del mártir, Gaspar Romero lo impidió y lo obligó a entregarle la valiosa reliquia. Él la había conservado estos treinta y cinco años. En ese lapso de tiempo, “el hueso se había deteriorado a una masa de polvo desmenuzado”, cuenta la conservadora Graffius. “Bajo mi consejo, Don Gaspar permitió que el hueso fuera secado, y yo lo separé en dos pequeños relicarios de cristal”, dice Graffius. “Uno de ellos fue retenido por la familia de don Gaspar, el otro que generosamente donado a las hermanas del Hospitalito de la Divina Providencia”, el lugar donde Romero había vivido los últimos tres años, y donde entregó su vida aquel fatídico 24 de marzo de 1980. “El proceso fue totalmente grabado, firmado y aprobado por un abogado canónico, y el relicario fue entregado a las hermanas en noviembre de 2015. Fue un día muy emotivo para todos”, cuenta Graffius. “Las hermanas habían creado un espacio para la reliquia, empotrado en el suelo de la habitación que servía de oficina, dormitorio y espacio privado de oración. 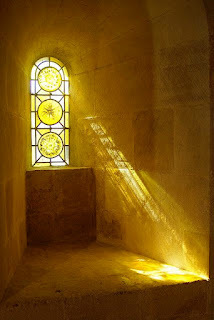 La reliquia quedó sellada bajo un azulejo de cristal, con iluminación discreta LED para su conservación”. El P. Jon Sobrino celebró la misa que oficializó la entrega. Romero al Policlinico; Don Gaspar con P. Sobrino e la reliquia. Una delle più notevole reliquie del Beato Oscar A. Romero è stato collocata nella piccola casa dove Romero ha vissuto nel campus dell’Ospedale Divina Provvidenza a San Salvador. La curatore britannica Janet Graffius racconta il processo nell’ultima edizione di Romero News, la newsletter del Romero Trust di Londra. La reliquia, dice Graffius, è “un sinistro ricordo del sacrificio di Romero; un pezzo della sua costola, rimosso al post mortem e affidato al fratello minore di Monseñor, Don Gaspar Romero”. Per contestualizzare la reliquia, è necessario tornare al momento in cui la reliquia è stato raccolta. Romero era stato inizialmente ammesso al Policlinico Salvadoregno per cercare di salvare la sua vita, ma alla fine è stata eseguita un’autopsia dopo gli sforzi per salvarlo hanno diventato inutile. Mentre la notizia dell’omicidio si diffuse in tutta la città, la gente hanno iniziato ad arrivare in ospedale, tra cui, i fratelli di Romero Tiberio, Mamerto, e Gaspar, e la sorella Zaida. “Quando sono arrivato, non volevano farmi entrare, ma li ho detto chi ero”, Gaspar Romero ha ricordato in un’intervista. “Circa 10 di sera, tutti i miei parenti sono venuti a, e ho passato tutta la notte lì”. Alla porta del policlinico mi sono imbattuto con la mia nuora. Lei dice, "Donna Zaida, Donna Zaidal", e tutti quelli che erano con lei mi hanno abbracciato. "Calmata, calmata, si dovrebbe ricordare ciò che li ho detto". Non volevano lasciarmi entrare nella sua stanza. "Entrerò", dissi, "perché sono stato al suo fianco per 26 anni". [Dopo sono entrata] ho baciato la sua fronte e poi non so perché ho stretto i suoi piedi. I suoi piedi erano già freddi, freddi. Che brutta cosa. Gaspar Romero e suo fratello Mamerto, anche morto, rimasti accanto dal corpo per ciò che sarebbe seguito. “Ho visto quando hanno aperto il lato sinistro del petto per estrarre i frammenti spezzettati del proiettile”, ricorda Gaspar Romero. La vedova di Mamerto ricorda come alla fine il fratello vividamente ricordato l’schegge nella carne e nei tessuti del torace. “Diceva tutto il tempo, è stato come granelli di sabbia e mai poteva dimenticarlo”, dice Tinita, vedova di Mamerto. Roberto Cuellar, membro del ufficio di assistenza legale arcidiocesano, è stato anche accanto al martire alla necroscopia. “La cosa più impressionante del’autopsia”, ricorda Cuellar, “è stato vedere come hanno rotto lo sterno, perché quelli erano metodi rudimentali senza seghe meccanizzati e strumenti elettrici che vengono utilizzati oggi. Con Romero, hanno dovuto usare una sorta di scalpello. Tap, tap, tap !, per rompere l’osso”, afferma Cuellar martellando l’aria. Secondo il rapporto dell’autopsia, “Il proiettile penetrato fino al cuore e ha seguito un percorso trasversale, infine, fermandosi alla quinta costola dorsale”. Dopo la procedura, la scena è diventata una sorta di caccia al tesoro in cui ognuno ha cercato di prendere qualche ricordo—o reliquia—di quel momento terribile, ma storico: una fiala di sangue di Romero che i medici avevano raccolto; lenzuola macchiati di sangue che le suore poi modellato in scapolari da distribuire ai fedeli; pezzi del proiettile; un fazzoletto usato per asciugare il sangue dal corpo di Romero ... anche la sua croce pettorale. Quando un giornalista stava uscendo con il pezzo di costola estratto dal petto del martire, Gaspar Romero lo fermò e lo ha costretto a dargli la preziosa reliquia. Egli ha mantenuto la reliquia questi trentacinque anni. In quel tempo, “l’osso si era deteriorato in una massa di polvere sbriciolato”, dice la curatore Graffius. “Sotto il mio consiglio, Don Gaspar ha permesso di asciugarsi l’osso, e ho diviso in due piccoli reliquiari di cristallo”, dice Graffius. “Uno è stato mantenuto dalla famiglia di don Gaspar, l’altro lui ha generosamente donato alle suore presso l’Ospedale della Divina Provvidenza”, il luogo dove Romero aveva vissuto negli ultimi tre anni, e dove ha dato la sua vita in quel fatidico 24 marzo 1980. “Il processo è stato completamente registrato, firmato e approvato da un avvocato canonico, e il reliquiario è stato consegnato alle suore nel novembre 2015. È stata una giornata profondamente emozionale per tutti noi”, dice Graffius. “Le suore avevano creato uno spazio per la reliquia, inserito sul pavimento nella stanza che fungeva da suo ufficio, camera da letto e spazio privato per la preghiera. 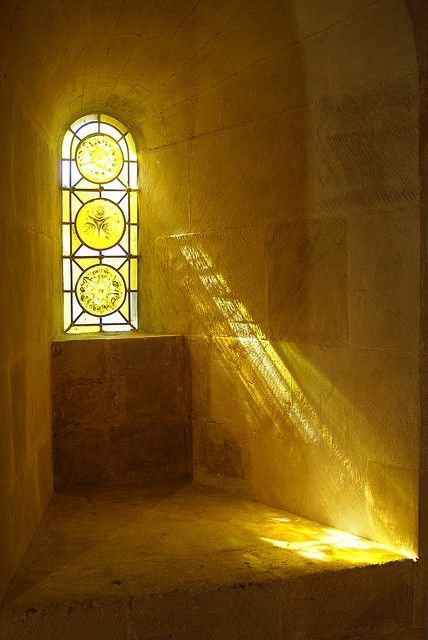 Una tegola di vetro sigillato la reliquia, illuminata da discreti luci di conservazione LED”. P. Jon Sobrino ha celebrato la Messa che ha formalizzato il passaggio di consegne. Reviving the red-yellow-green code system used here in the years leading up to the beatification of Blessed Oscar Romero, we can say that the canonization cause now stands under a YELLOW advisory. In this system, "green" denotes progress, "red" indicates stagnation and "amber/yellow" indicates moderate or slow forward motion. The designation of the yellow or moderate level now is based, among other things, in comments by the postulator of the cause, Archbishop Vincenzo Paglia, who told the site Tierras de América that he still expects Romero to be canonized, but not immediately. All the challenges and controversies have been overcome. “The only problem is the miracle,” Paglia told the Argentina-based website. “We have studied some cases of healing, but they cannot be put forward, and for that reason I have not even presented them [to the Congregation for the Causes of Saints]. We felt it was best to avoid rejections.” In January of this year the Salvadoran Church sent information on three unexplained cures attributed to Romero, two cancers and a coma, to Rome. However, those were not deemed sufficient and officials were asked to seek new cases. Information regarding three new cures was subsequently sent. It seems that God wishes us to savor the distinct stages of Blessed Romero’s commemoration: his beatification last year, the centenary of his birth next year, and his canonization in a year to come. Perhaps, we need to spiritually prepare ourselves. Perhaps, we need to make this a participatory and not a passive experience. We can all contribute to the cause by praying for miracles, by praying for a successful conclusion of the cause. Reviviendo el sistema de clasificación según los colores rojo-amarillo-verde utilizado aquí en los años previos a la beatificación del Beato Oscar Romero, podemos decir que la causa de canonización ahora se encuentra bajo un asesoramiento AMARILLO. En este sistema, “verde” denota progreso, “rojo” indica estancamiento y “ámbar o amarillo” indica un avance moderado o lento. La designación del nivel amarillo o moderado ahora se basa, entre otras cosas, en los comentarios por el postulador de la causa, monseñor Vincenzo Paglia, quien le dijo al sitio de Tierras de América que aún espera que Romero será canonizado, pero no inmediatamente. Todos los desafíos y controversias han sido superados. “El único problema es el milagro,” Paglia dijo al sitio web basado en Argentina. “Hemos estudiado algunos casos de curaciones, pero no se pueden proponer, y por eso ni siquiera las he presentado [a la Congregación para las Causas de los Santos]. Consideramos que era mejor evitar los rechazos”. En enero de este año, la Iglesia Salvadoreña envió información sobre tres curaciones inexplicables atribuidas a Romero, dos de cáncer y un coma, a Roma. Sin embargo, no fueron consideradas suficientes y se pidió a los funcionarios buscar nuevos casos. La información sobre tres nuevas curas se envió posteriormente. Parece que Dios desea que saboreemos las distintas etapas de conmemoración del Beato Romero: su beatificación el año pasado, el centenario de su nacimiento el próximo año, y su canonización en un año por venir. Tal vez, tenemos que prepararnos espiritualmente. Tal vez, necesitamos hacer de esto una experiencia participativa y no una pasiva. Todos podemos contribuir a la causa orando por milagros, orando por la buena conclusión de la causa. Rilanciando il sistema di codificati a colori rosso-giallo-verde usato qui negli anni precedenti alla beatificazione del Beato Oscar Romero, possiamo dire che la causa di canonizzazione si trova ora sotto una consulenza GIALLO. In questo sistema, “verde” indica il progresso, “rosso” indica stagnazione e “ambra/giallo” indica il movimento moderato o lento. La designazione del livello giallo o moderato ora si basa, tra l’altro, nei commenti del postulatore della causa, l’Arcivescovo Vincenzo Paglia al sito Terre di America, che Romero sarà santo, ma non subito. Tutte le sfide e le polemiche sono state superate. “L’unico problema è quello del miracolo”, Paglia ha detto al sito con sede in Argentina. “Abbiamo esaminato alcune proposte di guarigioni ma non sono proponibili, per cui non le ho neppure presentate [alla Congregazione per le Cause dei Santi]. Abbiamo ritenuto opportuno evitare bocciature”. Nel gennaio di quest’anno la Chiesa salvadoregna ha inviato le informazioni su tre guarigioni inspiegabili attribuite a Romero, due tumori e un coma, a Roma. Tuttavia, queste non hanno state ritenute sufficienti e funzionari sono stati invitati a cercare nuovi casi. Le informazioni riguardanti tre nuove cure è stato successivamente inviata. Sembra che Dio ci vuole assaporare le fasi distinte della commemorazione del Beato Romero: la sua beatificazione dello scorso anno, il centenario della sua nascita il prossimo anno, e la sua canonizzazione in un anno a venire. Forse, abbiamo bisogno di prepararci spiritualmente noi stessi. Forse, abbiamo bisogno di rendere questo un’esperienza partecipativa e non passiva. Tutti noi possiamo contribuire alla causa pregando per i miracoli, pregando per una positiva conclusione della causa. At last justice, for Romero? The Romero case is also “illustrative” of how the Amnesty Law formalized an official policy not to investigate. In the hours and days following the assassination [more on the crime], Judge Atilio Ramirez Amaya, the Criminal Judge of the Fourth Criminal Court in San Salvador, attempted to carry out a serious investigation of the crime, but was actively thwarted by police and other government officials. Judge Ramirez was surprised that police officials did not call him the night of the crime, as policy required, so he reported to the hospital where Romero’s body was being examined. He was surprised not to find any police presence when he arrived there. He asked his secretary to call the police. They never came. Following the autopsy, the Judge had his secretary once again phone the police to come secure evidence from the hospital, including bullet fragments found in Romero. They did not come. Late in the night, the Judge called the police to join him at the crime scene to search for and collect evidence. They did not respond. Judge Ramirez was forced to carry the sensitive material to his home in order to preserve it. The police did not show up at the crime scene until four days after the assassination, and they did not collect evidence there, nor provide any to the investigating judge. Judge Ramirez’ conclusions were not incorporated into the official report and the autopsy x-rays “disappeared” from the official file. On March 25, Judge Ramirez started receiving anonymous death threats. On March 27, two men arrived at his house, gained entry into the home and attempted to shoot Judge Ramirez with an automatic weapon. They shot his housekeeper. Judge Ramirez repelled the attack with a shot gun. They left in a getaway car, while unknown suspects walked on the roof of his house. Neighbors observed police cars parked nearby, ignoring the scene. In May 1980, the Salvadoran Army raided a farmhouse where Roberto D’Aubuisson and several of his associates were meeting. They arrested D’Aubuisson, and confiscated documents planning the Romero assassination. But the detained were soon released after the military intervened with the military-civilian junta then ruling the country. Various other furtive attempts to prosecute D’Aubuisson and his cronies were similarly thwarted during the 1980s. In 1987, the U.S. even captured one of the conspirators and was ready to extradite him for prosecution, but Salvadoran authorities dropped the charges and the U.S. was forced to release him. The enactment of the Amnesty Law in 1993, days after the Truth Commission named D’Aubuisson as the mastermind of the Romero assassination, frustrated all further efforts to hold him responsible. Back in 1980, the Archdiocesan Legal Aid Office was searched by the National Police in July of that year and files relating to the Office’s investigation of the assassination were removed, never to be seen again. The lawyers on the staff who were working on the case received death threats and were forced to flee the country. Notably, one of those lawyers was Florentin Melendez, who now serves on the Constitutional Chamber of the Salvadoran Supreme Court and was one of the magistrates who signed the unconstitutionality decree. 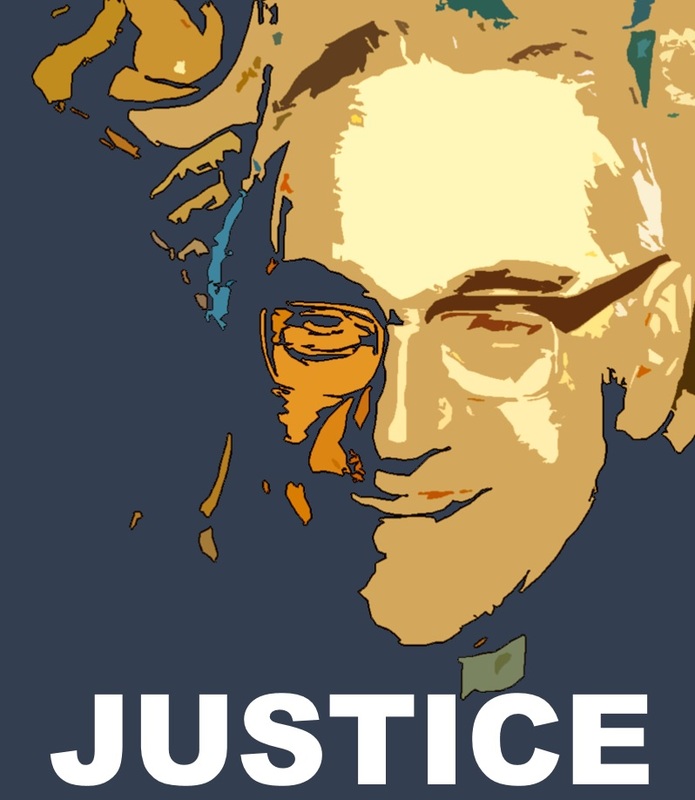 Perhaps now that the landscape has changed so dramatically, there may finally be justice for the victims, including Blessed Romero. In a pastoral letter published earlier this year, the current Archbishop of San Salvador called for exactly that. ¿Al fin, justicia para Romero?